Lynn Officials Want to Hear Your Thoughts on Building Out The Trail – Bike to the Sea, Inc.
Lynn residents, and those in nearby communities, are encouraged to let Lynn city officials know their thoughts about building out the trail there. 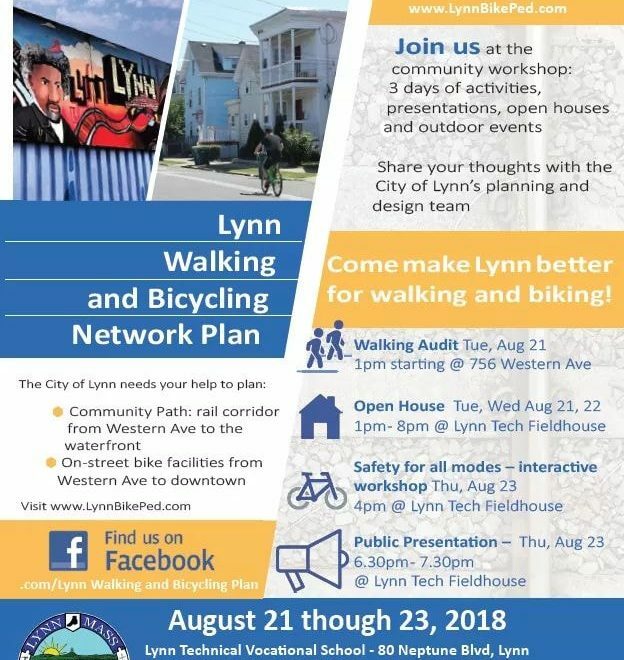 The city, in conjunction with Kittelson & Associates, Inc., is holding a three-day workshop from Aug. 21-23 at the Lynn Tech Fieldhouse, 80 Neptune Boulevard, to hear the community’s ideas and concerns about walking and bicycling in Lynn. The city is hoping the community’s participation will help them better plan extending the Community Trail from Western Avenue to the Waterfront and better plan the placement of on-street bike facilities from Western Avenue to downtown Lynn. Tuesday, Aug. 21, starting at 1 p.m. at 756 Western Avenue, there will be a walking audit. Tuesday and Wednesday, Aug. 21 and 22, from 1 p.m. to 8 p.m. at the Lynn Tech Fieldhouse, there will be an open house. Thursday, Aug. 23, at 4 p.m. at the Lynn Tech Fieldhouse, there will be a safety interactive workshop. Thursday, Aug 23, from 6:30 p.m. to 7:30 p.m. at the Lynn Tech Fieldhouse, there will be a public presentation. For more information visit http://www.lynnbikeped.com/ .